Your students will be engage in the active study of chemistry with CHEMISTRY: THE MOLECULAR SCIENCE, Fourth Edition. Authors Moore, Stanitski, and Jurs infuse their text with timely applications that reveal chemistry as a lively and relevant subject that is fundamental to a broad range of disciplines such as engineering, biology, and environmental science. The Fourth Edition features an enhanced problem-solving methodology, a complete revision of its award-winning art program to even better help students visualize chemical processes at a molecular level, integrated coverage of organic and biochemistry content, and full media integration with OWL Online Web Learning and Go Chemistry. 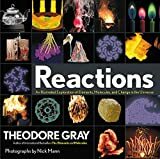 New content, more visualization problems, updated applications in a wide range of disciplines, and unique new end-of-chapter "grid" questions based on award-winning chemistry education research have been added throughout the text. In addition, many of the book's end-of-chapter questions are accompanied by interactive, assignable, online lessons in OWL--the #1 online learning system for chemistry.